For those of you visiting Portland for the first time, you may have heard a few things about our city but were maybe afraid to ask if they were true. First off, the answer is yes, we do like to keep it weird (and beered) here. Yes, it rains…a lot and us locals don’t use umbrellas (we own hoodies). Yes, IFC’s Portlandia is sometime a little too accurate of a representation on how we live. Yes, we are obsessed with beer, biking, coffee and the Trailblazers. And, yes, it’s really green here and you will find that the air we breath is some of the best in the country. Beyond being where dreams of the 90’s are still alive, Portland has also become a destination city for restaurants, food carts, local beers, distilleries and wines. No wonder we were one of the most moved to destinations in the United States. 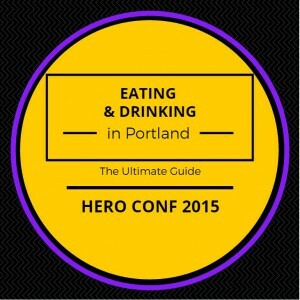 So in an effort to ensure that your visit to the Rose City (or Rip City to us Portland Trailblazer fans) is done right, this native Portlander has put together a guide on where you need to eat and drink in Portland while at the Hero Conf. I’ve got some great spots located close to the Hilton Portland & Executive Tower, along with some other destinations worth the cab fare, where you can enjoy a meal, find a great happy hour special, grab a cocktail or quench your thirst with one of Portland’s fine craft beers. Let’s start off with my true love. Beer (sorry, honey). 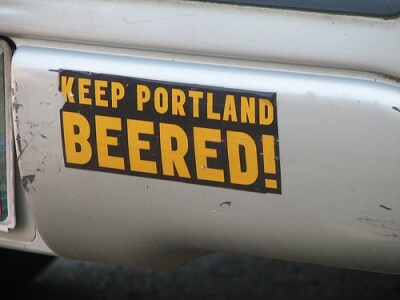 Almost every Portland restaurant and bar is going to offer at least a couple fantastic local beers for you to try. This is Beervana, and our great city has more breweries per capita (and strip clubs, but that’s another story / blog post) than any other city in the world. We also love our hops, so be prepared to select from a number of IPA’s and beers that have higher than you might expect IBU’s (International Bittering Unit – the scale used to measure hop bitterness in beer). Given the option, brews from local breweries like Laurelwood, Gigantic, Breakside, Ninkasi, Fort George, Boneyard, Burnside Brewing, 10 Barrel and Hopworks are always a sure bet. For those into sour beers, be sure to check out the offerings from Cascade Brewing. You can always visit one of those breweries, but if you are looking to geek out with fellow beer snobs and sample from 24 constantly rotating taps, look no farther than Bailey’s Taproom. As their goal is to offer the most eclectic selections of beer around, you are sure to find something that matches your tastes. A few additional places to get a pint include Rogue Distillery and Public House, Henry’s Tavern, Deschutes Brewery, Bridgeport Brewing Company, and the Yard House. Andy Ricker is a James Beard award winning chef and Pok Pok is the restaurant that put Portland’s food scene on the map. While this is one of my recommendations that is across the river and not within walking distance of the Hilton, the authentic Thai cuisine is worth the price of a cab fare. 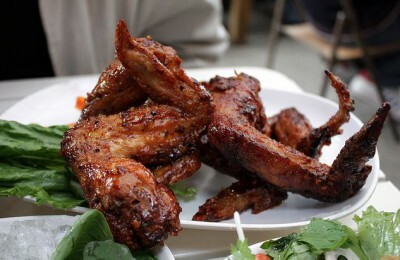 And if you do go, you’ve got to try their amazing Ike’s fish sauce chicken wings, which were named by Thrillist as one of America’s most iconic foods. While getting a table at James Beard award winning chef Gabriel Rucker’s Le Pigeon can be an extremely difficult thing to do (hint: go early and sit at the chef’s table), you can always try Rucker’s Little Bird to get your fix of his imaginative French cuisine. I’ve personally had one of the most amazing meals ever at Le Pigeon (another recommendation across the river) and highly recommend it if you are looking to be impressed and dine at one of the best restaurants in the good old US of A.
John Gorman might not have a James Beard award on his resume, but he is responsible for 3 of my favorite restaurants in Portland. 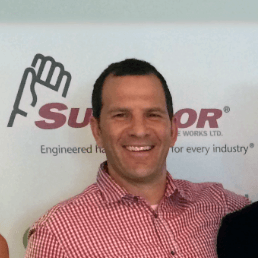 For my Hero Conference recommendation, you won’t find a better choice than Tasty N Alder. I’ve taken colleagues here many times and everybody always raves about the food. Take a big group and plan on sharing multiple dishes with your table. No conversation about Portland chefs would be complete without mentioning Naomi Pomeroy. Beast, her 24 seat restaurant, offers family styled suppers at communal tables where people are encouraged to chat freely with each other during and about their meal. While Naomi’s awards and recognitions are too many to list here, in 2014 she was the recipient of the James Beard award for Best Chef Pacific Northwest. Beast offers a six course, prix-fixe and service compris dinner with seating twice nightly Wednesday through Saturday, and one dinner Sunday evening. If you get in early for the conference, want to venture over to the other side of the river and enjoy food from one of Portland’s most talented and well known chefs (you may have caught her on Bravo’s Top Chef Masters) do yourself a favor and make a reservation at Beast. Screen Door offers hands down the best chicken and waffles in town. The only problem is that similar to that famous Portlandia brunch skit, the lines for Screen Door’s brunch are as famous as their food. Plus, their mouth watering chicken and waffles are only served during brunch hours and are not available with dinner. However, if you are in town early and want to experience something truly amazing (and don’t mind the long wait) I highly recommend a stop a Screen Door. While not as well known, Sunshine Tavern is a great second option to satisfy that chicken and waffles craving. This gastropub boasts chef Jenn Louis, who was voted as Food & Wine’s Best New Chef of 2012. As per their website, the food is simple fare made with the best ingredients and their fried chicken is served with Yeasted Semolina waffles, ham, clover honey and spicy lacquer. A warm, playful and welcoming environment makes this the perfect gathering place for family, friends and even #PPCChat members (although knowing how this group can get rowdy, please don’t tell them I sent you). While a little farther out than our other recommendations, NEPO 42 should also be mentioned as they too have a great Chicken and Waffles option, that comes with bacon. If you ask me (and the guys at Voodoo Donuts) nothing goes better with maple syrup than bacon. NEPO 42 offers house made American pub fare and 14 beers on tap. As their current beer list includes favorites from Double Mountain, Crux, Boneyard and Anderson Valley, its hard to go wrong with this option. Clyde Common is a European style tavern which offers delicious food and some seriously fantastic cocktails. Plus they have a very impressive list of whiskey and always some good local beers on tap. The open dining room lends itself to a boisterous casual setting perfect for your group of search marketers. It should also be noted that Clyde Common was just named as a semifinalist for the 2015 James Beard Awards under the Best Bar Program category. Andina showcases some of the best local ingredients fused with popular dishes found from the coast of the Andes throughout Peru. This is a great place to go with a large group so you can order and share from a wide selection of their amazing Peruvian inspired tapas. They also feature some mouthwatering main courses and a great selection of cocktails and wine. I’ve eaten here several times in the past with just my wife for our anniversary and with large parties for birthday celebrations. 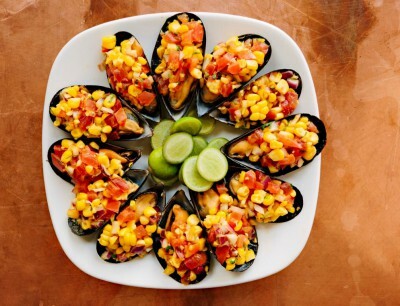 Make sure to try one of their four types of cebiche, a signature dish of Andina’s. Raven & Rose offers classic farmhouse cookery and fine cocktails in Portland’s historic Ladd Carriage House built in 1883. According to their website, the dining room menu is inspired from the Irish and British countryside, while its upstairs bar “The Rookery” provides an exclusive hideaway for enjoying cocktails inspired by the building’s exuberant history. Raven & Rose is a great choice for a full course meal, or just a quick cocktail in their exquisite upstairs bar. Veritable Quandary is a Portland institution, and if the weather is nice, offers one of the best outside dinning experiences in Portland. Open since 1971, the VQ (as the locals call it) has been a consistent mainstay in the growing Portland dinning scene and the ideal spot to impress family, friends and business colleagues. Like most of Portland’s top restaurants, the VQ creates culinary delights for its regional market-driven menu by utilizing local farmers and other specialty food purveyors. Jake’s Famous Crawfish has been a Portland landmark for more than 110 years. Featuring a variety of fresh fish and seafood, along with northwest products and ingredients, they offer quality meals served in a traditional and timeless presentation. With it’s dark wood décor, seasoned wait staff and old school vibe, Jake’s is truly a Portland institution. While Jake’s has been around for a long time, Huber’s is Portland’s oldest restaurant, having been established back in 1879. Specializing in a traditional turkey dinner, Huber’s also serves wide range of classic American dishes. But most locals know Huber’s for their signature drink…the Spanish Coffee which is prepared tableside with great flair. If nothing else, the presentation alone is worth a stop at Huber’s. 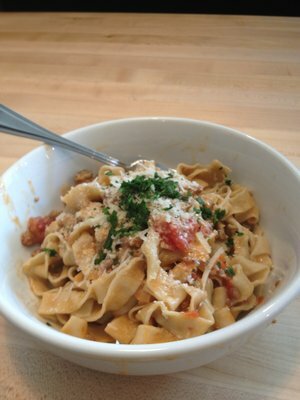 Tagliatelle – photo by Joe M.
Back in 2010, GQ named Gruner one of the 10 Best New Restaurants in America. I’ve eaten here a few times and have never been disappointed. As their website states, “Gruner is cozy alpine cuisine”. Think old world comfort meets new world sophistication. Grassa is known for its handmade pastas and casual setting. There is usually stoner rock playing on the turntables, but as their website states, no you can’t get a tattoo here. Not that you would want to as you will be kept plenty busy choosing between the fabulous Radiatore, Squid Ink Fettuccini or the mouthwatering Carbonara. I’ve not personally eaten (yet) at Racion but everybody I’ve talked to who has insists that you must try their tasting menu. The restaurant is divided into an open kitchen bar (first of its kind in Portland) and a lounge. The food is modern Spanish, and if you enjoy the art, preparation and presentation of a meal, you will certainly want to give Racion a visit. To experience a touch of Spain in Portland you will want to visit Ataula, which was recently named as one of the 25 Most Outstanding Restaurants of 2015 in GQ Magazine’s March issue. At Ataula you will experience a modern interpretation on the traditional Spanish “tapeo” culture. Langbaan is a new Portland restaurant that is already racking up awards and recognition, being named Portland Monthly’s Restaurant of the Year for 2014, The Oregonian’s 2014 Restaurant of the Year and #3 in the previously referenced 25 Most Outstanding Restaurants of 2015 by GQ Magazine. Alan Richman from GQ says Lanbaan is “A two-hour Thai vacation in the Pacific Northwest” and deems “This is the first Thai food I’ve eaten that made me wish I lived over there.” While Lanbaan is not in walking distance, for those who are looking to experience some of the best food Portland has to offer, it is certainly worth the quick cab ride over. Reservations are required as they offer a fixed menu. 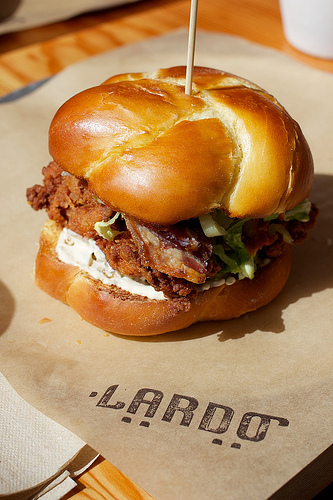 Lardo started out as a food cart, but now has two brick and mortar locations. This sandwich shop not only boasts some of the most delicious sandwiches Portland has to offer, but also 12 taps of mostly local beers. The Good Earth Café is a great spot for the most important meal of the day…Breakfast (not Happy Hour, which is what I originally thought). Offering a full breakfast, char-broiled burgers, artisan sandwiches, and fresh baked goods, the Good Earth is a great choice if you need a quick meal before diving into the conference sessions. Cheryl’s on 12th offers a little bit of everything as it is a restaurant, bakery and market. For dining in they offer breakfast, lunch, morsels and supper specializing in New American cuisine. Their expansive menu offers everything including soups, salads, sandwiches, wraps, salads, burgers, meatloaf, steak, omelets, scrambles and their famous Portuguese Fried Rice. Cheryl’s really is the place to go if you want a wide selection and great food. Tilt is ais the place to go for Burgers, Handcarved Sandwiches, Big Salads and a slice of old fashioned pie. This blue collar inspired restaurant and bar will leave you full and happy and their from scratch biscuits n’ gravy make for the perfect hangover recipe should you need it. Mi Mero Mole, is the place to go for authentic Mexican cuisine. Don’t go expecting your typical American styled Mexican food, as each item is made from scratch and are traditional dishes you would find in Mexico City. Little Big Burger offers exactly that…little burgers with a big burger taste. Or as Jules Winnfield says, “Mmm-mmmm. That’s one tasty burger”. LBB keeps the menu simple by offering a limited menu focused on burgers, cheese burgers, veggie burgers, fries and root beer floats. Reminds me of how In-n-Out likes to roll. Focus on a few items and do it well. Nong’s Khao Man Gai is a one trick pony, but that pony does one hell of a trick. 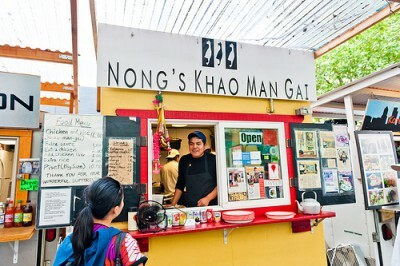 When you go to Nong’s Khao Man Gai you will be getting….yep, Khao Man Gai. Just what is Khao Man Gai? Chicken and Rice. Or from their menu, “Poached, organic chicken with rice simmer in chicken stock and Thai herbs, served with sauce of fermented soybeans, ginger, garlic, Thai chilies, vinegar, house made syrup and soy sauce. Garnished with cucumbers and cilantro, and accompanied by a light soup. Nong’s is open Monday thru Friday from 10am to 4pm. 808 is the area code for Hawaii, a place known for its warm weather, sandy beaches and love of Spam. And while you can find Spam Musabi and the required side of macaroni salad with every plate, 808 Grinds also offers some fantastic Hawaiian inspired food. 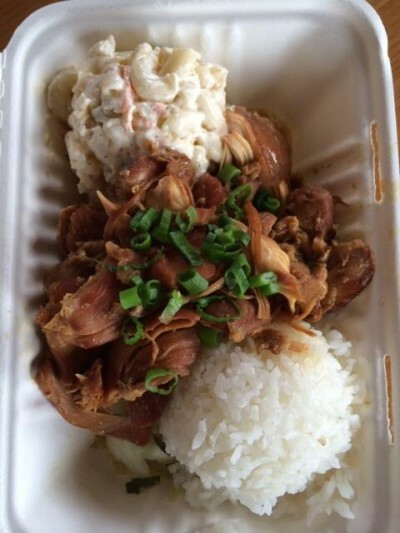 You can’t go wrong with both the shoyu chicken and the 808 fried chicken. If you are like Anthony Bourdain and love all things pork, then get your little piggy self over to the People’s Pig. Yes, as the name suggests this isn’t a place to take your vegan friends, because they are all about the pork. This is certainly one of the top carts in town and a great way to experience what Portland’s food cart scene is all about. I highly recommend the porchetta sandwich. 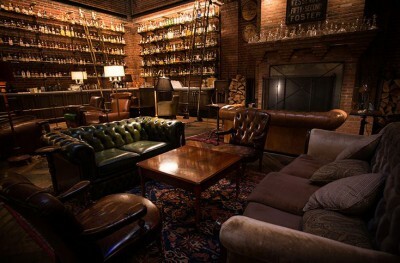 Multnomah Whiskey Library is Portland’s hottest attraction, which is why some people have willing waited over 2 hours just to get in. What is the fascination with the place? To start they have an extensive selection of whiskey and other libations. Next, the setting certainly reminds one of a library; definitely an old money feel to this place without being stuffy or intimidating. Finally, the servers don’t prepare the drinks behind the bar, but in front of you at your table. Tips for getting in? Don’t go on weekends. Go early or go late. You can show up early, get your name in and then go next door to Kask or Tasty N Alder for a warm up cocktail while you wait. They will call your cell phone when your seat is available. In Portland you will find that most restaurants and bars have some amazing Happy Hour menus. And happy hour doesn’t mean just getting a buck or two off of your drink; happy hour is typically a meal all unto itself. So while most of our other recommendations like the Davis Street Tavern and Andina have great happy hours, here are some additional places to get some great food at really low prices. My WebRanking colleagues and I stopped by The Ringside Fish House for happy hour a few weeks ago and we were all impressed. Now, if you are planning to go, make sure you get there early. The happy hour menu is only available in the bar area and while it accommodates many, it fills up fast. However, they are used to being busy and despite how crowded it was on my last visit, we had our drinks and first round of food within 10 minutes of being seated. In my house Pizza has been elected as one of the basic food groups. No food guide would be complete without at least one place to satisfy a pizza craving. While Oven and Shaker is great any time of day, it’s hard to beat getting a Margherita pizza for only $7. While you can also pair your pie with some great local beers, Oven and Shaker also feature some amazing cocktails on their Happy Hour menu. Yes Ruth’s Chris is a chain restaurant (that’s actually considered a bad word here in Portland) but almost everybody I’ve talked to when doing my research for this post recommended them for their happy hour. So if you don’t need something distinctively Portland, this is a great option for happy hour. I’ve got to be honest in saying that I really don’t know a lot about the Red Star Tavern and looking at the reviews on Yelp they seem to be very mixed. However, the one thing I have heard about is their happy hour menu. So while I wouldn’t necessarily recommend them as a place for dinner, if you are hankering for some cheap eats, this might be the place for you. If you are craving something sweet don’t give in to the hype known as Voodoo Donuts. Seriously, just don’t do it. The line is long and the donuts are just ok. Instead try one of these great options for something to satisfy your sweet tooth. 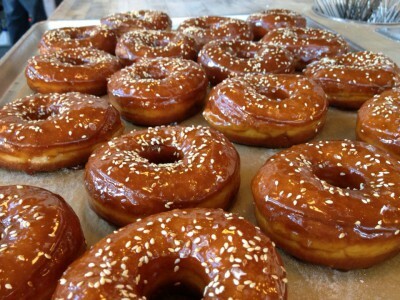 Blue Star is the more delicious gourmet version of Voodoo, offering a wide selection of unique donuts made from a classic brioche recipe that originated in the south of France. With flavors like Blue Berry Bourbon Basil, Pistachio Cheesecake with Raspberry Hibiscus glaze and Bacon Maple, you will most likely enjoy a donut experience unlike anything you’ve had before. Ruby Jewel’s owner started selling her homemade ice cream sandwiches out of a cooler at Portland farmers markets. Today you can find their ice cream sandwiches in stores across the country. Using local ingredients, every flavor is carefully hand crafted daily. Go in for a cone, or have them make you a custom ice cream sandwich on the spot. 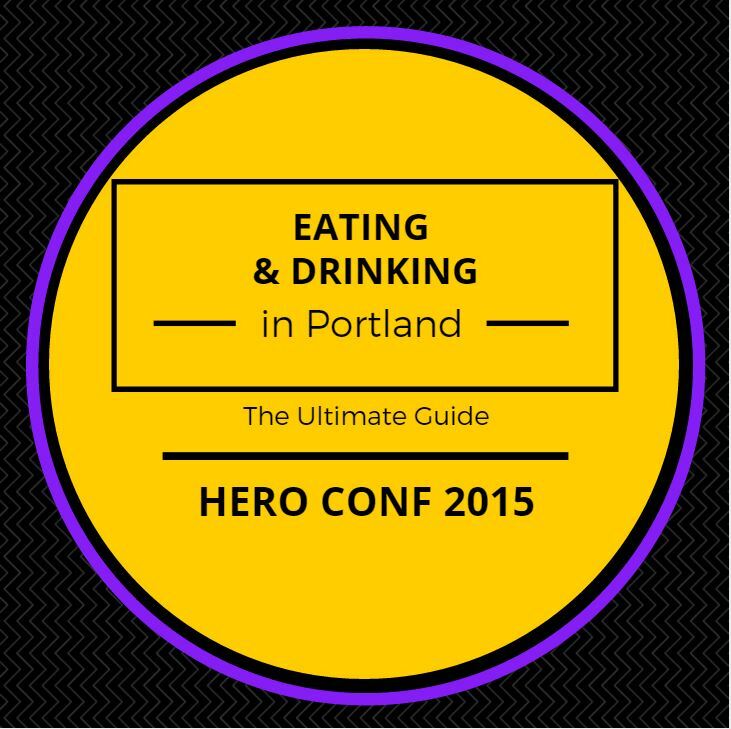 So there you have it…my recommendations for where you should get your eat and drink on while attending this year’s Hero Conf. Oh and if you need any other recommendations, hit me up on Twitter @twistedlister.